This is College Physics Answers with Shaun Dychko. The position of an object undergoing simple harmonic motion is given by this cosine graph. Here is the position as a function of time. It is the amplitude times cosine of two pi frequency times time. So what's important is to notice this graph begins at a y position equal to A, the amplitude. It begins at maximum displacement from equilibrium. This is the equilibrium position zero and it begins here, and then sometime later gets to its equilibrium position, and then sometime later gets to negative A, and then back to equilibrium, and then back to its starting position at distance A from equilibrium. So it covers this distance A once, and then twice again, and then three times, and then four times. 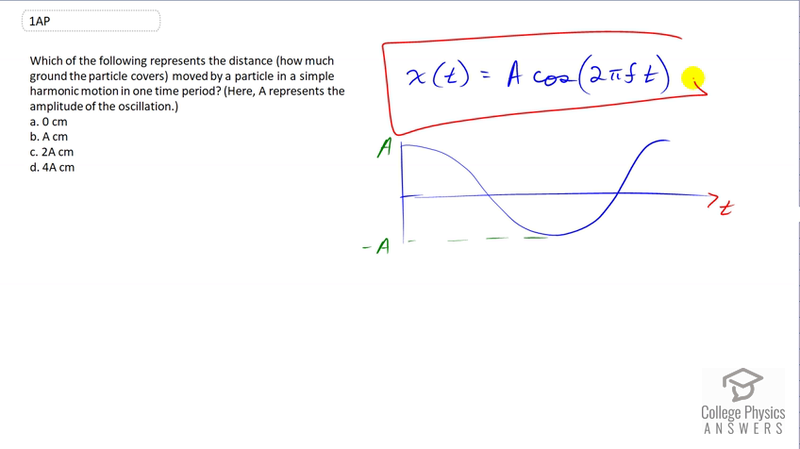 The answer is four A is the distance traveled in one full oscillation, or one time period.